I owe Shiva Rea a debt of thanks. A few years ago, when I got too pregnant to continue with my usual yoga class, I turned to her excellent Prenatal Yoga DVD to keep me limber...and I truly believe she deserves some credit for the relatively short, easy labor that brought my daughter into the world. Her newest DVD is Shiva Rea: Daily Energy—Vinyasa Flow Yoga; given our history, I felt compelled to give it a try. I owe Shiva Rea a debt of thanks. A few years ago, when I got too pregnant to continue with my usual yoga class, I turned to her excellent Prenatal Yoga DVD to keep me limber—and I truly believe she deserves some credit for the relatively short, easy labor that brought my daughter into the world. 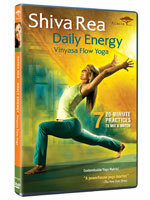 Her newest DVD is Shiva Rea: Daily Energy—Vinyasa Flow Yoga; given our history, I felt compelled to give it a try. Daily Energy offers seven 20-minute practices (along with a few shorter options) that can be mixed and matched to fit your particular yoga desires and time frame for that day. Some are enlivening (for those “I am woman, hear me roar” days), while others relaxing (for those “I’m so stressed I want to scream” times). When you select the Yoga Matrix option, you can click on as many of them as you want to do, in whatever order you want to do them. Or you can just click on one if you’ve got a mere 20 minutes to spare (which is often the case for me). There are also shorter sequences, for meditation, core moves, forward bends, and Shavasana (aka, total post-practice relaxation); you can make them a part of your personal “matrix,” do them separately, or ignore them altogether. And if you’re either too lazy to put your own program together or not sure the best way to combine the routines, there are also several preset practices to choose from. Rea’s delivery, as always, is soothing and melodic. She gets a little New Agey at times, but uses some vivid, effective imagery to help get your body moving in the right way (one of my favorites, in the Water segment: “Imagine your body is like a buoy in the ocean.”) And if you get tired of listening and simply want to do, you can choose the “music only” option once you become familiar with the routines. There’s a lot to be impressed with here: There’s a good variation among the seven main practices, and Rea packs a lot of creative moves into each one. Plus the set, with its blues, golds, and greens, is captivating, with Rea undulating on a circular wooden center stage like a joyous mermaid on an ocean-encircled reef. Some words of caution, however: This DVD is not for yoga newbies, and not just because some of the poses are challenging. Rea moves very quickly from pose to pose, sometimes even getting ahead of her words, and it can be hard to keep up. I do yoga regularly and still found myself falling behind time after time. I might have been more successful if Rea had used the English names for the moves, but she mostly sticks with the Sanskrit versions, some of which I’m not familiar with. If I had known which pose we were headed into, perhaps I could’ve gotten there faster. Rea also gives very few form tips, so it’s up to you to make sure you’re not hurting your body. Many of these poses undulate, which could be hard on your knees or back if you aren’t careful. All that being said, if you know what you’re doing and don’t mind playing a little catch-up the first few times through, Daily Energy is an excellent way to get your om on. Pros: You can create a variety of workouts to match your mood and available time, the routines are creative, and the presentation is gorgeous. Rea's delivery is calming too. Cons: Rea moves a bit too rapidly from pose to pose and she gives little advice regarding proper form. Not for beginners. Extra tip: The first few times through each routine, keep the remote close by so you can pause to allow yourself time to get into each pose properly.